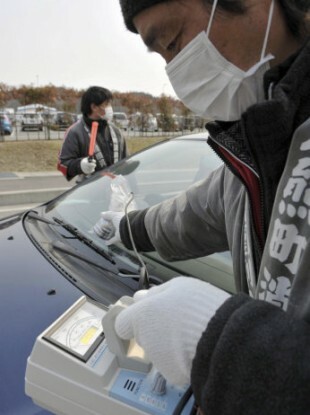 A fireman checks a devise to check the level of radiation on a vehicle before its owner and resident evacuates to other city, in Tamura city, Fukushima prefecture, northeastern Japan, Saturday, April 2, 2011. IT COULD TAKE several more months to bring Japan’s tsunami-ravaged nuclear plant under control, a safety agency spokesman said today as engineers tried to find a way to stop highly radioactive water from pouring into the Pacific. The Fukushima Dai-ichi nuclear complex has been spewing radioactivity since the March 11 tsunami carved a path of destruction along Japan’s northeastern coast, killing as many as 25,000 people. The final death toll is not known because many are still missing. Nuclear safety agency spokesman Hidehiko Nishiyama on Sunday offered the first sense of how long it might take to bring an end to the nuclear crisis, which has forced people within 20 kilometers of the plant to abandon their homes due to radiation concerns. Bringing the reactors at the plant under control will require permanently restoring cooling systems knocked out by the tsunami that prevent reactors from dangerously overheating. That task has been complicated by dangerous conditions at the plant that have often forced workers to stop what they are doing. Some new problem crops up at the complex nearly every day. Workers discovered a 20 centimeter crack in a maintenance pit Saturday and said they believe water from it may be the source of some of the high levels of radioactive iodine that have been found in the ocean for more than a week. They have had trouble telling where the water is coming from, and this is the first time they have found it leaking directly into the sea. A picture released by plant operator Tokyo Electric Power Co. shows water shooting some distance away from a wall and splashing into the ocean, though the amount is not clear. The contaminated water dissipates quickly in the ocean but could pose a danger to workers at the plant. Engineers tried to seal the crack with concrete on Saturday, but that didn’t work. So on Sunday they injected a mix of sawdust, shredded newspaper and a polymer that can expand to 50 times its normal size when combined with water. The polymer mix has not yet stopped the leak but engineers have not given up hope and should know by Monday morning whether it will work. TEPCO confirmed the first tsunami deaths at the plant itself, saying a 21-year-old and a 24-year-old were conducting regular checks when the 9.0-magnitude earthquake that preceded the tsunami hit. They apparently ran to a basement turbine room, which is where they were when the massive wave swept over the plant. “It pains us to have lost these two young workers who were trying to protect the power plant amid the earthquake and tsunami,” TEPCO Chairman Tsunehisa Katsumata said in a statement. The high levels of radioactivity at the plant made searching for the men dangerous. Their bodies were not discovered until Wednesday and had to be decontaminated. The announcement was delayed while authorities notified their families, TEPCO spokesman Kazufumi Suzuki said. The nuclear crisis has compounded the suffering of people in the northeast and, at times, overshadowed their plight. Tens of thousands have lost their homes and are living in shelters, 200,000 households do not have water, and 170,000 do not have electricity. Email “Second attempt to plug Fukushima leak not working”. Feedback on “Second attempt to plug Fukushima leak not working”.